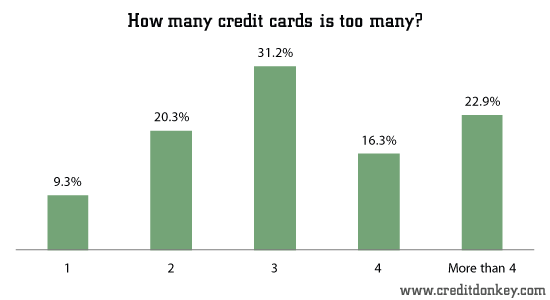 Nearly one-third of survey respondents, believe 3 credit cards are too many for one person to have, according to a recent CreditDonkey.com survey. And 23% said more than 4 is too many. Just 9% believe one credit card is too many. How many credit cards do American consumers actually have? According to Federal Reserve Bank of Boston, the average credit cardholder has 3.5 credit cards. If you want to maximize rewards by using several different cards in a strategic way, it's OK with your credit score, too – as long as you use them wisely. Mitchell Weiss, author of Life Happens - a Practical Guide to Personal Finance from College to Career says "you really only need two cards---one for your budgeted expenses and the other for life's unhappy surprises. That way, your mainstay card will be balance- and therefore, interest-free, while the other card takes the hit. Just be sure to have a plan to pay it off as quickly as you're able." If you currently carry a balance and want to do a balance transfer to a low interest credit card, read our guide on the balance transfer game. If you don't carry a balance and simply want to take advantage of some of the lucrative introductory deals out there, read our updated credit card deals blog post. To be sure, you should routinely check your credit report to make sure you don't forget about that card you opened years ago to get a free pizza on campus (thankfully, a practice that is no longer allowed under recent legislation). (From November 19 to November 27, 2012, CreditDonkey.com surveyed 1,045 Americans, age 18 and over using multiple choice questions and short-answer questionnaires. Share on Facebook "How Many Credit Cards is Too Many?"